If you want to insert the document name in Word’s header or footer, follow these steps. Go to File, Properties. 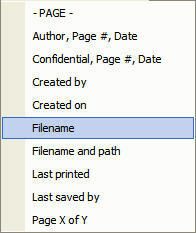 This is where you can add metadata about the file, such as the document name, owner, date and keywords. 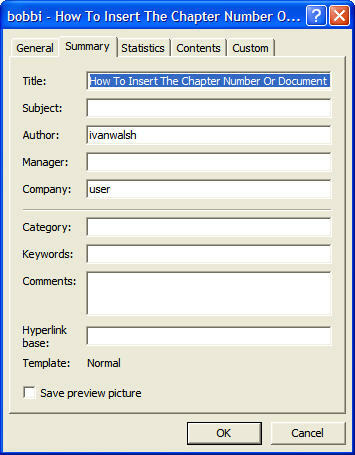 Enter the document name in the Title Field (i.e. first field)Close this and return to the Word document as usual. From the Insert drop-down menu, select Filename. This adds the Filename to the Footer. If you have other questions about Microsoft Word, let me know in the comments below. As the menu is different in both versions, I have included the steps for 2003 first. To do this with 2007, click the Start button and then look for the Options. You can also add the date, page numbers, and other information this way. It’s the simplest way to keep your Microsoft Word documents organized. If you have other questions about Microsoft Word, drop me a line.